Thank you to our PTA and all the volunteers and participants in this year’s colorful fun run. Judging from the dyed shirts, faces and bodies, it was a smashing good time. I am glad we were able to have such a great community event. Last week I shared an article about how to raise independent children. One of the suggestions in the article is to let your child struggle through conflicts in his or her life. Research states that teenage drama is actually necessary for brain development. Having said that, sometime adults need to step in to provide guidance and sometimes discipline. We have also learned from research that teenagers need their parents as much or more than they did when they were younger. Teenages crave adult attention and supervision. This is equally true at home as well as at school. 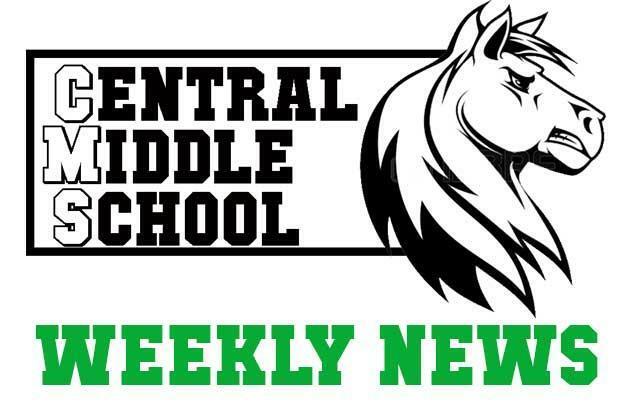 This week I would like to write about some of the measures we have adopted over the past few years to make sure Central remains a safe and supportive place for our students. A large part of our mission at CMS is to build a strong school community that is tolerant and respectful of everybody. Because of this, we plan on sustaining our focus on a Supportive and Inclusive School Community. We are continuing the work we have been doing in implementing a system of Positive Behavior Intervention and Support (PBIS), a research-based framework designed to improve school climate, reduce problem behavior, and increase instructional time. We supplement this with Restorative Practices which combine community building, developing empathy for one another, and rebuilding trust when it has been broken. When we started this work a couple of years ago, we worked with staff, PTA, Site Council, and our student leadership groups to establish a vision of what we wanted our school culture to be and developed the following school climate vision statement. At CMS we continually strive to create a positive, inclusive learning environment with a community of students, staff, and parents who are RESPONSIBLE, RESPECTFUL, SUPPORTIVE and SAFE. We have a committee of staff members who meet throughout the year to carry out this vision. We work with our student leadership groups to plan student events such as Ally Week, No Name Calling Week, The Great Kindness Challenge, etc. We also spend time explicitly teaching and reviewing our core values (Responsible, Respectful, Supportive and Safe). We define what these values look like in different locations around the school and stress these core values throughout the year with the goal that every student understands what we stand for. We also promote these values through a system of positive reinforcement. All staff and parent volunteers on campus distribute “Pride Cards” when we see students exhibiting behaviors in line with our core values. Not only does this encourage good behavior, it also helps us build positive relationships with students through those interactions. We believe that by simultaneously providing support and clear expectations (and interventions when needed) we can help our students develop productive habits and healthy relationships. When our kids know that we value them personally, they will develop higher levels of self-confidence and they will feel safe enough to take risks with their learning. The CMS staff wants students to feel safe enough to make mistakes and learn from them both in and outside the classroom. I hope that by explaining to our families our disciplinary procedures, you will understand why we dedicate so much of our time and energy to building community. Even when disciplinary action is required, because we have taking the time to build relationships with our students our actions do not come across as overly punitive or unfair. As much as we stress positive support, there are times that we need intervention. Watch for more information about that next week. It is well worth the few minutes it takes to read it. What I appreciate the most is the concrete examples it gives on what to talk about with your teen. Students are invited to participate in the annual Halloween Costume Contest at recess this Wednesday. Students can enter one of the following categories: creative, scary, group, and funny. Any students interested in participating can sign up using the Google Form emailed to their school emails. I know there is a High School Happening section to this newsletter, however, there are some new procedures for high school enrollment for Sequoia HS District. Open enrollment will not be considered without a completed address verification form. We look forward to seeing everyone at the next PTA meeting on November 14! Please note due to scheduling conflicts, the time has changed to 8:45am. We apologize for the inconvenience but hope that you can still join us! November 1 is the deadline to collect PTA donations and we are $8,000 away from our fundraising goal. Thank you to the 200-plus Central and Arroyo families that have joined as Parent Partners so far. Only 40 more family donations will ensure continued support for teacher grants, library, Art-in-Action, garden and other programs and events. Thank you so much to all who came out to run the rainbow with us! We raised a lot of money to support our schools and hope you all had fun. Thank you especially to all of the wonderful volunteers who arrived early to set up, stayed late to clean up, kept us fed and happy with donuts and coffee, took pictures, supervised the registration and first aid tables, and fearlessly served as color sprayers and course marshalls. Thank you also to the incredible Stampede and Soar team for your time, enthusiasm, generosity, creativity, support and heart: Brian Jett, Becky Mock, Luann Rosmando, Sara Taylor, Joyce Romeo, Mandy Rivas, Shelley Knowlton, Kelin Ingallis, Leslie Ostrander, and Beth Rowell. Enrollment for kindergarten/transitional kindergarten begins November 1, 2018! The Parent Information Night is designed to provide parents/guardians with information about the San Carlos School District and it’s programs and to address any questions that they might have regarding the registration process. Should you have any questions about this event or the registration process please contact the District Office at 650-593-1452. ROPES (Rite Of Passage ExperienceS) registration is now open! Don't forget to register by November 9, 2018. No late registrations will be accepted. For more information on ROPES or to register, visit https://scsdk8.edlioschool.com/apps/pages/index.jsp?uREC_ID=1121411&type=d&pREC_ID=1394181 For questions, please contact ropes@scsdk8.org. Just a quick thank you to all the amazing volunteers who helped make the Book Fair a success! We couldn't have done it without you. Also, a big thank you to all the parents and students who attended the Book Fair. Money raised at the Book Fair directly funds important library and PTA programs. In case your student has asked - the dragon beat out the unicorn in the All About Books contest. Win a Vacation Rental for Spring Break in Orlando, and make your family’s Florida vacation dream come true! Win a 6-night stay in a two-bedroom villa at Sheraton Vistana Resort Villas at Lake Buena Vista in Orlando. Sleeps 8.